The international fragmentation of production led to the emergence of Global Value Chains (GVCs), which have contributed to the structural interdependence of the world economy (Baldwin 2013). GVCs are mostly about combining value added from different sources, and their impacts span many dimensions affecting international trade and investment, the labour market and productivity. GVCs change the way policymakers interpret trade policies, exchange rate fluctuations and external competitiveness. It is essential to understand the nature and dynamics of GVCs if we are to reap benefits from international trade and also assess the role, if any, that economic policy can play in shaping their evolution. This poses a challenge to traditional policymaking, and it is incompatible with the protectionist rhetoric that has recently been gaining strength. 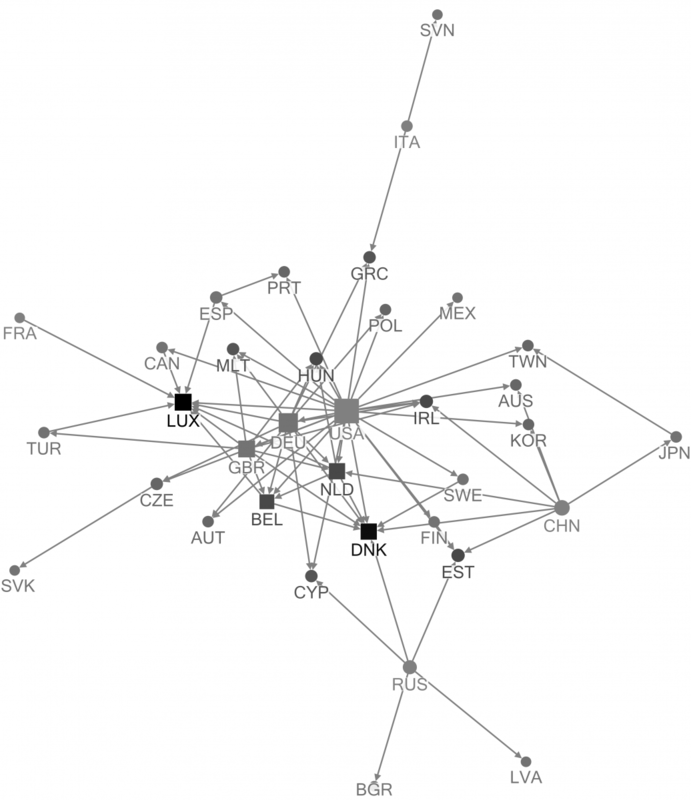 As the world becomes increasingly interconnected, network analysis is a powerful tool to examine the international flows of value added and the positions of countries in GVCs. Network analysis also lets us study the input-output (I-O) relationship between any two countries in a structural way, taking into account the interdependence among all participants in GVCs, rather than in isolation. In our recent research (Amador and Cabral 2016), we took the World Input-Output Database (Timmer et al. 2015) and used network analysis tools to examine the evolution of value-added trade. More specifically, we focused on the concept of 'foreign value added' in exports, as defined, for instance, in Koopman et al. (2014). In this concept, domestic and foreign value added are combined to produce exports, which may later be embodied in other products, or consumed as final goods and services. 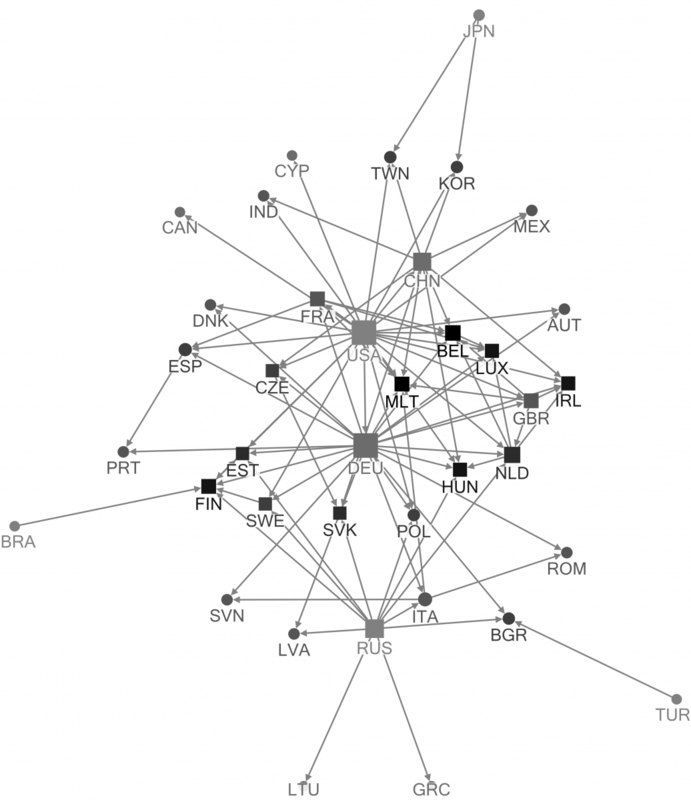 In each year, the GVC is represented as a directed network of nodes (40 countries) and edges (value-added flows between them). The role of different sectors in the organisation of GVCs is one important dimension of the networks of foreign value added in exports. 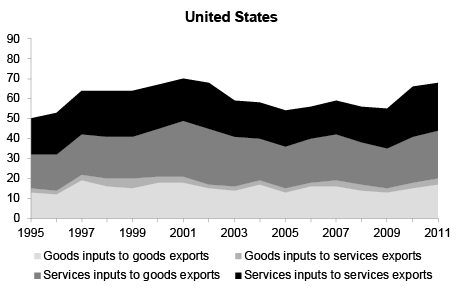 The four panels of Figure 1 show the roles of goods and of services as both inputs and outputs in value-added trade networks in 2011. The comparison of panels (a) and (b) shows that foreign value added of goods is mostly used in GVCs that lead to exports of goods. 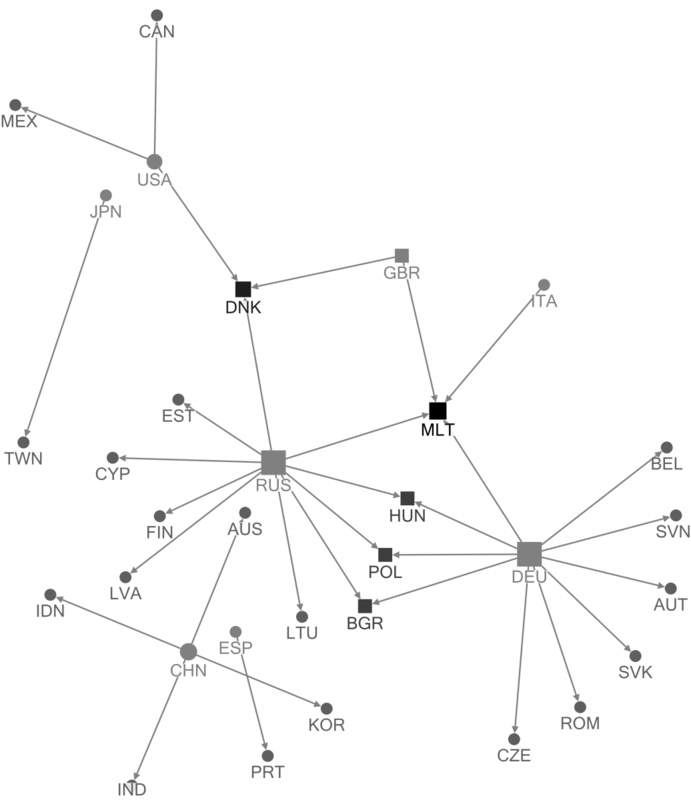 The network of foreign inputs of goods used in exports of services is the least dense of the four networks. This is not surprising, as classical GVCs relate to trade in parts and components to be embodied in stages of the manufacturing process, while goods typically tend to be embodied in services as energy sources. The analysis of panels (c) and (d) reveals that foreign value added of services is embodied in both exports of goods and of services. The efficient operation of GVCs involves significant inputs of services, like logistics, transportation and other business services, and depends on their availability at low cost. The network of services foreign value added in goods exports depicted in panel (c) is also consistent with recent evidence on the importance of services as inputs in the production of goods in GVCs (Francois et al. 2015), and of mode 5 supply of services (Cernat and Dimitrova 2014). The increasing relevance of services embodied in goods exports has consequences for the definition of trade rules. These currently separate goods from services, raising new challenges for policymakers. The reading of panels (a) and (c) shows that foreign value added in goods exports comes both from goods and from services inputs, while foreign value added embodied in services exports originates mostly from services inputs, as we see in the comparison of panels (b) and (d). In recent decades, progress in information and communication technologies, and the fall in telecommunication costs have enhanced the development of GVCs in the services sector. The network displayed in panel (d) confirms that exclusively services-based GVCs exist. Figure 1: Network graphs of goods and services foreign value added in goods and services exports in 2011. (a) Goods inputs to goods exports. 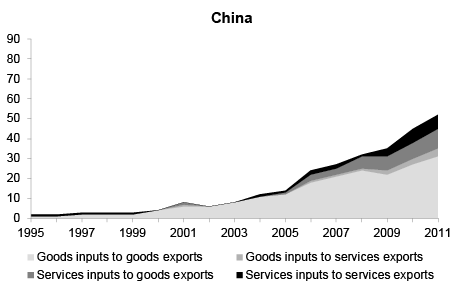 (b) Goods inputs to services exports. (c) Services inputs to goods exports (d) Services inputs to services exports. Notes: The networks are directed and the arrows that represent the edges point towards countries whose exports embody more than 1% of value added from the source country. The size of each node is proportional to its total degree and the shade of the node is mapped to its in degree, with darker shades indicating higher values. The nodes that belong to the k-core of maximum order are shaped as a square. The network graphs are based on the Harel-Koren algorithm and are drawn with the use of NodeXL. A complementary approach compares the four main suppliers of foreign value added in exports to assess which I-O supply linkages were dominant hubs for GVCs between 1995 and 2011. 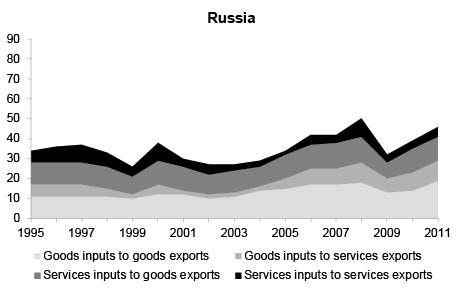 Considering each of the four detailed goods and services networks of Figure 1, Figure 2 shows the evolution of the values of the outdegree centralities of Germany, the US, China and Russia. Figure 2: Main four suppliers of foreign value added in exports (1995-2011). Notes: The outdegree is the number of outgoing connections of a country and reflects its importance as a supplier of foreign value added in exports. In each panel, the values of outdegree centralities of the country are those obtained in each of the four networks of Figure 1, considering goods and services both as inputs and as outputs. Germany and the US participate robustly in GVCs over the whole period, but with meaningful differences between them. 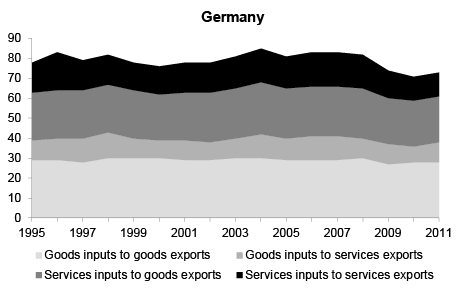 Germany mostly supplies inputs to be embodied in other countries’ exports of goods, while the US plays a key role as a supplier of services inputs to be used in exports of goods and of services from other countries. The fast-rising importance of China as a supplier of value added chiefly reflects the supply of foreign inputs of goods to exports of goods. Russia is also an important supplier of goods inputs to goods exports, mainly due to its role as a major source of energy products. At present, value-added networks are more developed and integrated in the production of exports of goods than of services. Nevertheless, the international fragmentation of production also takes place in the services sector. It could be argued that the liberalisation of services trade, in a context of increased demand for services around the world, would prompt the expansion of GVCs towards more foreign value added of services being embodied in both exports of goods and of services. There is still room to expand the networks of value-added trade in the global economy through stronger integration among developing countries. Despite intense research, the mapping and measurement of GVCs is still incomplete, and the use of network analysis tools creates valuable results. Networks are relevant to understand the structure and organisation of world production, and research into this is still in its infancy. 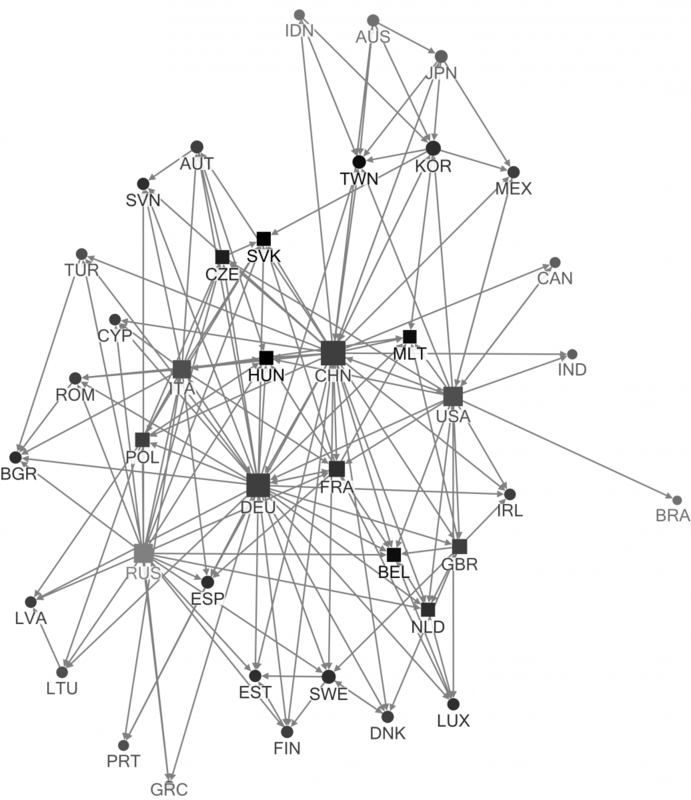 A complex network approach that considers the full set of linkages among countries, and their different positions in GVCs, can help assess how globalisation affects each economy, and to identify appropriate policies. The analysis of GVCs is key to understand the international creation and distribution of value, as well as the capacity of countries to prosper in an increasingly interdependent world. In this context, recent political statements against international trade are worrying. A well-informed debate on opportunities and risks associated with GVCs has become more important than ever. Authors’ note: The opinions expressed represent the views of the authors, they are not necessarily those of the Banco de Portugal or the Eurosystem. Amador, J. and Cabral, S. (2016), “Networks of Value-added Trade”, The World Economy, forthcoming, doi:10.1111/twec.12469. Baldwin, R. (2013), “Global Supply Chains: Why They Emerged, Why They Matter, and Where They are Going“, in D. K. Elms and P. Low (eds. ), Global Value Chains in a Changing World (Geneva: World Trade Organization), Chapter 1, 13–59. Cernat, L. and Dimitrova, Z. K. (2014), “Thinking in a box: A “mode 5” approach to service trade”, Journal of World Trade 48(6): 1109–1126. Francois, J., Manchin, M. and Tomberger, P. (2015), “Services Linkages and the Value Added Content of Trade”, The World Economy 38(11); 1631–1649. Koopman, R., Wang, Z. and Wei, S.-J. (2014), “Tracing Value-added and Double Counting in Gross Exports”, American Economic Review 104(2): 459–494. Timmer, M. P., Dietzenbacher E., Los B., Stehrer, R. and de Vries, G. J. (2015), “An Illustrated User Guide to the World Input-Output Database: The Case of Global Automotive Production”, Review of International Economics 23(3): 575–605.